It's pouring this morning. And cold. Which means we won't be taking our usual walk or playing outside. My kids tend to go quite bonkers when they can't get out and run around. For various reasons my kiddos didn't get outside yesterday either, which means energy levels are going to be through the roof today! But I'm prepared. I've got three things up my sleeve that usually keep them quite occupied on such a day. And these are especially good for toddlers and preschoolers any time! They also can be serious sanity savers when you are trying to homeschool and they just want to be right beside you but you need them to be quiet-ish. 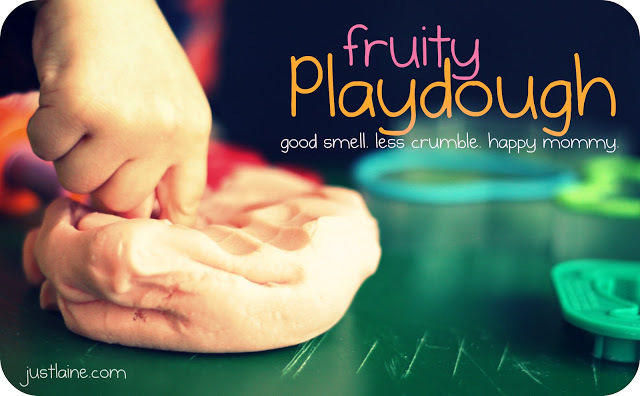 First up, Fruity Playdough. I've posted this before, but honestly it needs a re-mention every once in a while. It's the BEST playdough EVER. My kiddos will play for hours! Next we have Ooey-Gooey Slime. Go ahead mommas, just make it! There's something so mesmerizing about it...you try to get it out and it seems rock hard, then you take a hard glob in your hand and then suddenly it oozes through your fingers and settles back down into a flat layer in the bottom....your little people will have fun with this one, I promise! What do ya'll do to stay occupied on a rainy day? I would love to hear your great ideas! Maybe I added a little too much flour, but after kneading it all was smooth, but then it started crumbling a lot while they used it. We kept rolling and softening as we picked up the crumbles. After storing in the fridge for a couple of hours it seemed to get dry already so we just rolled and softened again. Any thoughts on the next batch?